A pre-purchase building and pest inspection are carried out during the purchase of a new home. 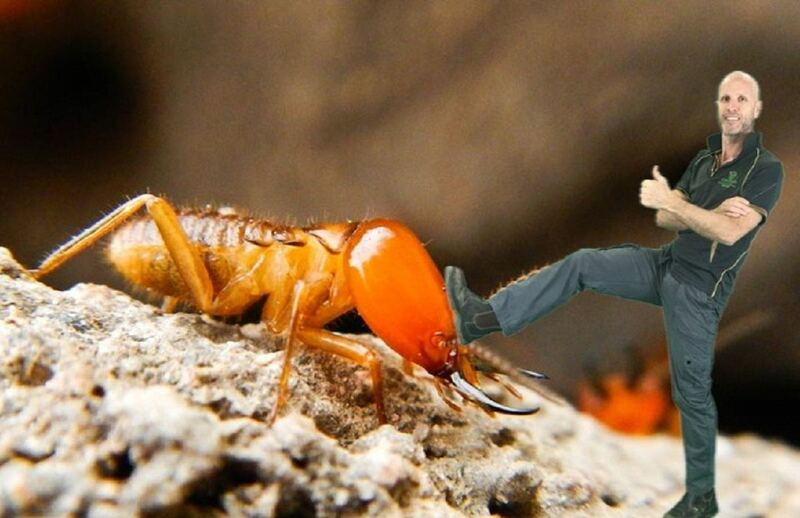 The inspection is similar to that of a termite inspection. The main difference being during the pre-purchase inspection the inspector is also looking for signs of borers. 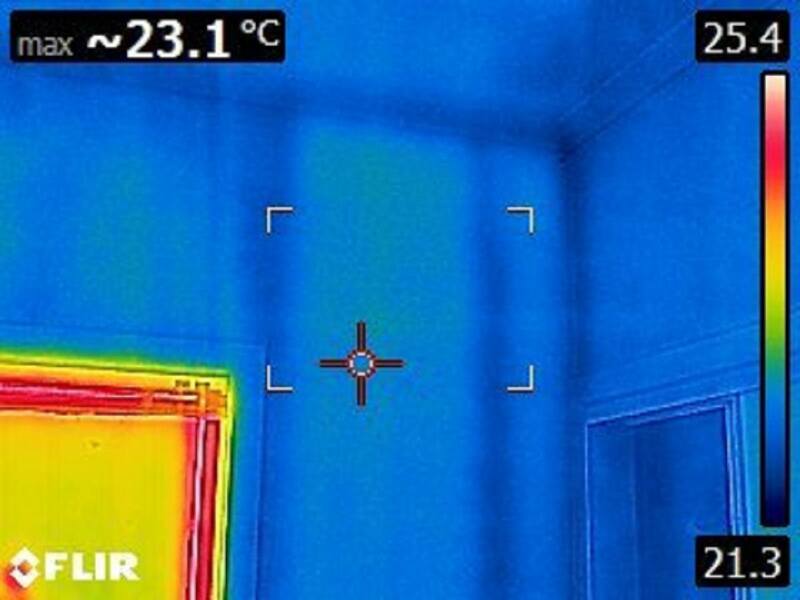 Most customers these days request the use of thermal imaging cameras during the inspection. Not many companies will actually do this or if they do they may charge more. The inspection should be a complete and comprehensive audit of the home. Once the inspection is complete a report should be issued. The report will give the buyer details of what is or is not wrong with the building. Where issues are pointed out in the report a recommendation will be given to fixing the problem. It’s important to read the reports carefully before going ahead with the purchase. If live termites are found this will be an added expense to the purchase price. The same thing goes for structural damage or bad workmanship. If structural issues are found it could end up costing a lot of money. Reading the report properly and fully understanding what it all means is crucial. If you don’t understand the report find someone that will or call the company you hired. Thermal imaging has been around for many years now and they are a great asset to any pest inspector. Using the thermal imaging camera is relatively easy understanding the image is the important part. What the camera does is makeup heat signatures of the surface that it’s pointed at. So the different surfaces behind the wall are highlighted showing up any anomalies. If there are active termites behind a wall the camera will show this up. At this point, a more invasive inspection will be required. When a more invasive inspection is recommended in a pre-purchase building and inspection report it may mean cutting holes etc; through wall panels. This will have to be accepted by the current owners of the building beforehand. The cost of invasive inspections is usually the responsibility of the purchaser. When a hole is cut into a wall a borescope can be used to see more clearly what’s happening behind the panelling. A borescope is a camera on the end of a long flexible lead attached to a monitor. The monitor will display what the camera see’s giving a much clearer assessment of the findings. Once the invasive inspection has been completed another smaller report will be issued detailing what was found. The pre-purchase building and pest inspection report can be a bit overwhelming to understand. But there are some basics that everyone needs to know to make the report easier to digest. Let’s not forget the report will determine whether or not a sale is made so it’s important to understand the contents. Below we will go through some of the important areas of the report to hopefully make it a bit clearer. There are four main sections of the report to look at and they are listed below. Everyone wants to know if thermal imaging has been used so this is the first section we will look at. The other three sections are to do with conducive conditions and if termites have been found. The reports can be either emailed or handwritten. Here at Sunnystate, we prefer to use the electronic reporting system as it gives much more detail than the written one. The first and most obvious thing to do is start at the beginning so many people skip through and this is when things are missed. The first two pages will give details of who the report is for and who completed it. It will also let the purchaser know if a thermal imaging camera was used during the inspection. To know if a thermal imaging camera was used look at the section named (Inspection details) as shown in the image below. Then look for (Non-standard Tools Used) the make and model of the camera will be listed. 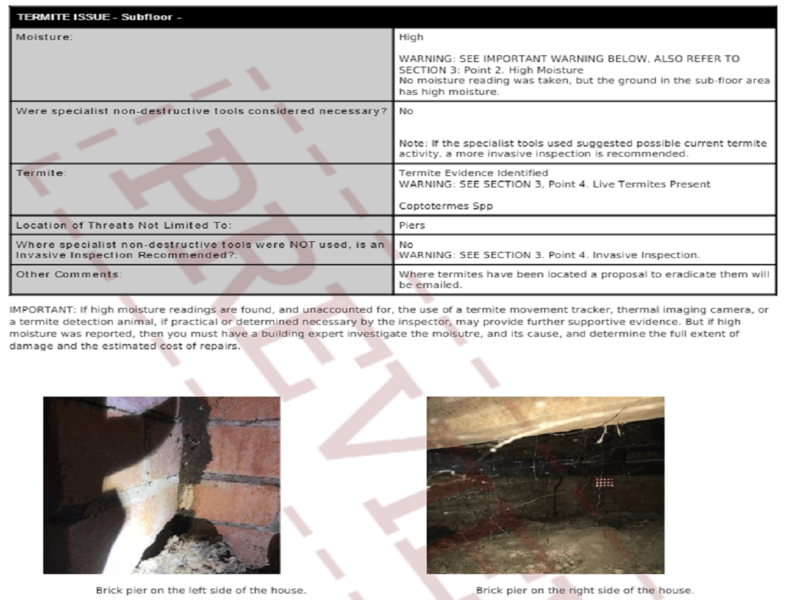 Other sections of the report to look at are (Access Issue) and (Termite Activity) this is on page 4 of this report as seen below. If an access issue is present this may be because there is no physical access available such as areas in the roof void. Where an area is locked or access denied by the owner they will appear in the access issue section. Where rooms are locked or access has been denied by the owner the question of why should be asked. Your inspector can only give information on the areas they inspect. So if there are areas with limited or no access for whatever reason they will be in this section of the pre-purchase building and inspection report. The words “yes” or ‘No” will be seen next to each section indicating if an issue is present. The third part we’ll look at is the (Conducive Conditions) section on page 7 of this report. This is an important area to read carefully. This section will give details of any problems around the home that may be conducive to termite activity. The conducive condition section, will detail the interior and exterior and also vegetation found against the home. Let’s get these areas into perspective as many people are scared off by the finding in this part of the pre-purchase building and pest inspection report. This section gives suggestions or recommendations of what is needed to make the home better positioned against termite attack. It’s not saying there are termites present just ways to prevent them. If termites are present they will be mentioned in the (Termite Issue) which we’ll come to next. 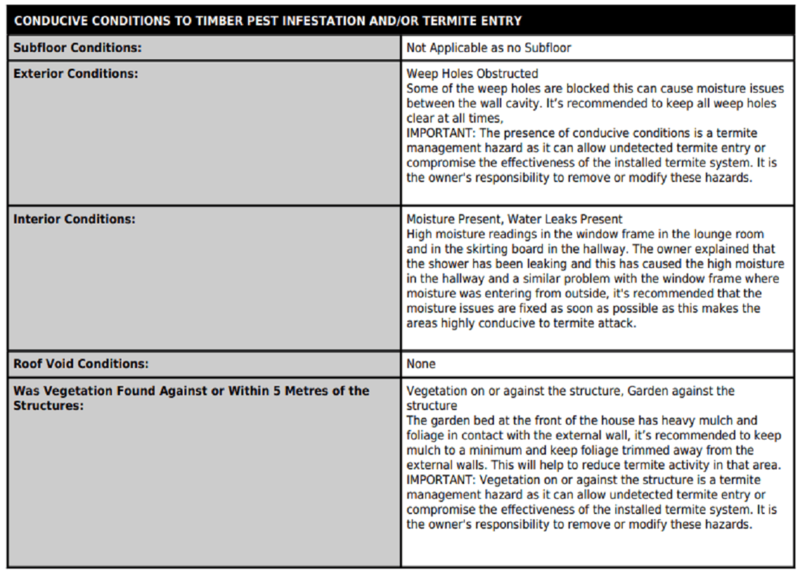 If no live termites have been found then this section of the report is the most important. The reason being is that it gives recommendations on what needs to be done around the property. The most common issues are going to be drainage issues. These can be caused by faulty down-pipes or air-conditioning system draining to the footings. Anything that will cause water issues around a house should be mentioned in the report. When this section is read and understood correctly an informed decision can be made on the purchase of the property. Serious drainage problems can be very costly to repair and they will also attract termites. Conducive conditions will also refer to vegetation around a home. Where there is a build-up of vegetation against external walls the higher the chances of termite activity. It’s always recommended in termite report to clear vegetation away from external walls. Heavy vegetation and mulch can also block weep-holes. Termites can gain concealed access to a house via the weep-holes. When this happens serious damage can because before they are detected. This is why this section of the report needs to be read thoroughly. Sort out the areas of concern as marked in the report as it will make your home more termite resistant. Have a look at the image below it will give an idea of what a report will say. The final part of the report we will look at comes under (Termite Issue) on page 9. This is only ever present if termite activity has been found during an inspection. This area of the report is self-explanatory it will highlight a termite issue. Details of the termite species found should also be present in the report along with its location. Knowing what type of termite is present will determine the course of action for treatment. In the report below the species Coptotermes was found in the sub-floor of the house. This is the most destructive termite found in Brisbane and they need to be treated properly. Where termites have been found a termite proposal which is a treatment plan will be issued along with the termite inspection report. The treatment plan will give details on the type of treatment necessary. The treatment will include a colony control and a full termite barrier. Which company to use for a pre-purchase building and pest inspection is something to consider. One thing to remember is that builders aren’t termite inspector and vice versa. It’s best to hire a company that has separate inspectors one for the building and one for the termite report. This way you know your hiring experts in their field I’ve written an article on this before click here to learn more. The main points to take out of this article is to read your report carefully. If you don’t understand the report ask the company that issued it to explain it. Most companies are happy to fully explain the findings of a pre-purchase building and inspection report. The better you understand the report the better decision you can make. Buying a house isn’t a cheap exercise these days. You don’t want any unexpected cost after the purchase like repairs from termite damage. Here at Sunnystate, we will look over a report for you if there are things you don’t understand. All you have to do is send us a copy via our site click here to send a report. We hope this article was helpful please feel free to leave your comments below.